If you’re on the hunt for something casual yet culinary in the Fenway area, this Portland, Maine transplant knocks seafood out of the park. Located in the Van Ness building on Boylston Street, Eventide slings all things aquatic, from award-winning lobster rolls to oodles of Northeastern Oysters in an unpretentious joint right around the corner from the ballpark, putting an urban spin on the classic New England seaside seafood shack. 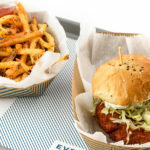 It’s a chef’s menu at Eventide—with exotic ingredients and unlikely flavors popping up in traditional favorites like chowders, fish sandwiches, and burgers—but with a fast-casual twist: your order is still taken by someone with a tablet, delivered over the counter, and served in cardboard containers on a tray. Oysters are the star of the show, with an assortment of accoutrements ranging in style from classic to charmingly weird. The ‘Cold’ section of the menu is rounded out by funky raw-bar offerings and a couple of creative salads, and the ‘Hot’ is dominated by buns, stews, and sandwiches. Finish things off with a bite from the ‘Sweet’ side, featuring playful riffs on the desserts of your youth. There’s no bar at Eventide, but fret not, there’s still plenty going on in the beverage department. House-made sodas and local kombucha mean you’re not relegated to water for your workday lunch, and there’s beer and wine both on tap, with interesting and ever-changing selections from all over the map. Anyone who’s visited the Portland location will feel right at home, with bright blues and seersucker stripes keeping the vibe light and breezy as you coast toward the counter. The centerpiece of the space is an enormous hunk of granite hewn from the rocky coast of Maine that holds Eventide’s daily selection of oysters displayed over buckets of crushed ice. It feels like a little slice of the seaside in the city, with warm wooden communal tables standing on poured-concrete floors, big friendly fish in frames on the wall visible through floor-to-ceiling windows that blend into the luxury apartment building’s facade, and text messages sent to patrons to confirm that their freshly shucked oysters are ready for pickup. New Jersey native Ian Maschal’s passion for the culinary industry started at a young age. Every summer, he worked at his family’s seaside businesses – an ice cream store, chowder shop and fudge shop – on Long Beach Island. Years later, Maschal refined his love for food and hospitality at Johnson & Wales University, graduating in 2009 with a culinary degree. While at J&W, he interned with the New England Patriots for three years, eventually becoming the Sous Chef in charge of catering operations for Gillette Stadium’s 89 private suites. For the next several years, Maschal held positions at restaurants throughout New England, most notably Sous Chef at Barbara Lynch’s acclaimed Menton and Opening Executive Sous Chef at Bar Mezzana, a seafood-forward Italian restaurant from chef Colin Lynch. In 2017, he joined Big Tree Hospitality as Chef de Cuisine at Eventide Fenway, assisting with opening operations like kitchen layout, menu development and staffing and training. Maschal is excited to get back to seaside-inspired dining at Eventide Fenway, a modern, metropolitan cousin of the beachfront businesses of his youth.